Love Live Music? We've Got Lineups You Don't Want to Miss - Eat. Drink. Buy Art on Delmarva. Looking for live music with less crowds? Our towns along the coast of Maryland and Delaware have you covered with concert venues and music festivals that feature national recording artists, famous headliners and the best in local and regional talent. Get your calendars out and start marking them — small town vibes with big music shows are just the ticket for your summer getaway. Year to year, the Freeman Stage outside of Fenwick Island, DE, wows fans with concert lineups featuring all genres from symphony to reggae and rock bands. The much buzzed about lineup for summer 2019 does not disappoint with headliners like the John Butler Trio, Gavin DeGraw, Kool & the Gang, Tito Puente, Tedeschi Trucks Band and the Beach Boys. This small but adequate outdoor venue is set in the beautiful Bayside community and gets you up close to performers. You won’t go hungry or thirsty while you’re there with plenty of local food trucks and craft beers and wines to keep you in the spirit. Sinatra tributes, the symphony, a Queen musical and the Ten Tenors are among the lineup at this indoor concert hall. Enjoy a show on a fall or spring visit to the resort when things are a little less hectic at the beach. Enjoy live performances with the beach and boardwalk as the background. Each year, over 40 bands are selected to perform in an open-air concert venue just steps from the beach. The goal of the Rehoboth Beach Bandstand is to provide entertainment through music, movies, variety acts, and other local, regional, and national performances. Concerts and shows from Broadway to blues and tribute bands take place in this indoor arena. Originally erected in 1950 as a war memorial, the Wicomico Youth & Civic Center is operated by Wicomico County, Maryland. Unfortunately, a fire ravaged the building in 1977, but it was opened again in 1980 after being rebuilt. Today, the WY&CC is operated under the umbrella of the County’s Recreation, Parks & Tourism Department. The Civic Center boasts a 5,600 seat 30,000 square foot arena, a 10,000 square foot secondary space with a fixed stage, as well as ten customizable meeting rooms all bearing names of battles fought by the United States – Normandy, Midway, Flanders and Danang. LeAnn Rimes is among the concerts at the official kickoff festival for the summer season. Also check out Almost Queen and Night Ranger with special guest The Reagan Years. Hugely popular yearly event on Main Street in Berlin. Bring your own chair! The Festival, a division of OuterArts Maryland, Inc., combines world-class mentor musicians and gifted pre-professional apprentice musicians for an intense Festival experience the first two weeks of each June. All apprentices receive full scholarships and housing in private homes. The two groups rehearse and perform side by side in orchestral, chamber, solo recital, choral and chamber opera repertoire. In two weeks, these musicians present over 30 concerts and over 200 free open rehearsals for music lovers from around the world. New this year, Jellyfish is more than just music. Located beside the main stage, you’ll find the Jellyfish Village. It will be five blocks of interactive, family-friendly activities and fun. It will include a fitness challenge, a skateboard and bicycle zone, a secondary music stage, as well as vendors and artists. Headliners include Badfish and Ballyhoo. This is the largest East Coast camping and music festival that grows yearly and covers many music genres. Travis Scott, Panic at the Disco, Death Cab, Lauren Dangle, Hippo Campus are just a few of the bands in this year’s lineup. 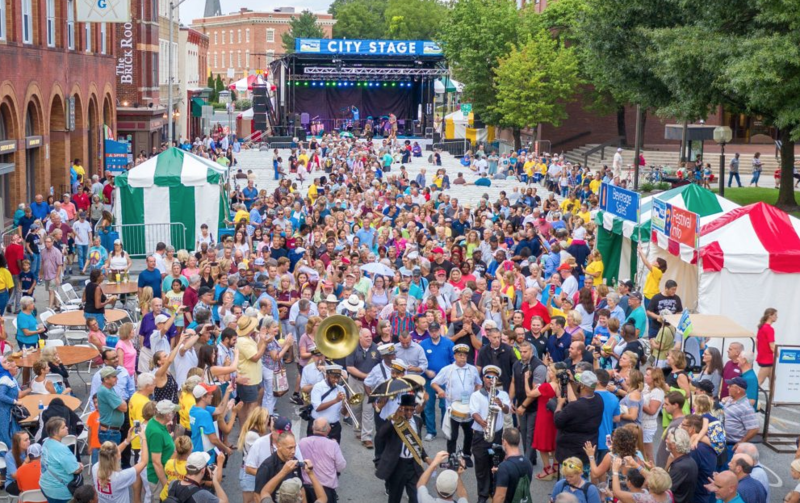 This fun open air street festival in downtown Cambridge from 5 to 10pm on September 21 will feature earthy, soulful music tapping into the character of downtown Cambridge and our local musical heritage. As well as lots of great BBQ, vendors, and music to enjoy! Established in 1989, this event brings national and international Grammy Award winning artists to Coastal Southern Delaware…the festival is local and our artists are global. Check out Kategory 5, Lower Case Blues, Mama’s Black Sheep and Hoochi Coochi at this haunting event full of entertainment and activities at the Historic Milton Theatre.